As we have already mentioned and discussed in different posts, one field of application of Virtual Reality in the tourism sector is tourism promotion. VR offers the viewer the possibility to get a 360° sneak peek of a destination. VR is already a popular promotion tool at fairs, but there are also possibilities to explore your dream destinations from home. 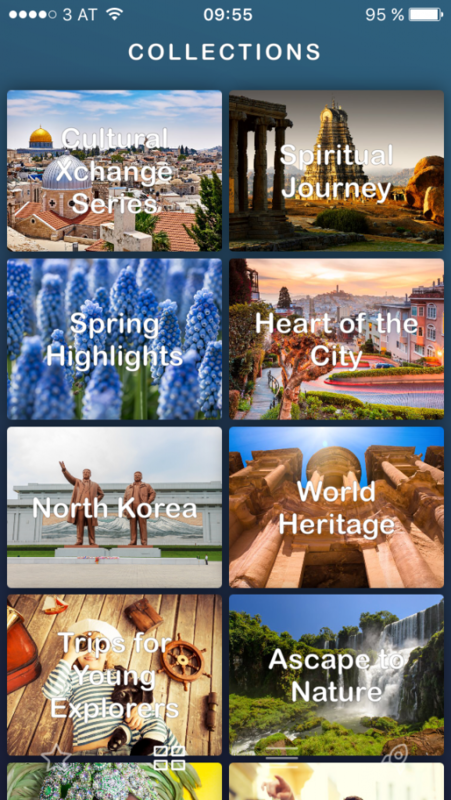 Today we would like to introduce you to Ascape, an app which lets you (a)escape every day life and experience a wide range of places virtually. Places from all over the world can be experienced with Ascape. Different interfaces allow the user either to explore the provided destinations randomly or browse through various collections (e.g. Trips for Young Explorers, Underwater Mystery, Experience Wildlife, World Heritage, and many more). Furthermore, there is also a series available called Cultural Xchanges that allows the viewer to learn more about cultures. In general, each video provides a short description and credit is given to the content producer. If the chosen trip has been downloaded, it is saved in the app and can also be viewed offline. Daniel Moroz, cofounder of Ascape, shared with us some information about the app, developments and current progresses. The combination of personal interest and passion for the topic of VR as well as the idea to be able to teleport to any place on earth motivated Daniel and his team to develop Ascape. “We want everyone to be able to take a virtual trip anywhere from their homes.” The application serves not only as an entertainment platform but also as a source of inspiration. Ascape was founded in 2015 and not only the user numbers but also the amount of available VR trips is growing constantly. Daniel and his team created a platform for professional as well as private content producers to showcase their immersive 360° videos. From the submitted videos, only the best ones are selected and provided on the app. The growing content and user numbers demonstrate that there is big interest in as well as demand for virtual trips. How will this interest and demand influence the development of VR in tourism? Daniel is convinced that VR offers a lot of great possibilities, but he does not consider it as a threat for the tourism industry. 360° live streaming might develop and give people the opportunity to teleport in real time to the other side of the planet. For Daniel, live streaming sounds attractive for a couple of mins, but a story behind will inspire viewers even more. Keeping this in mind, he believes that VR is a perfect tool for tourism promotion and travel inspiration by providing stories. A destination can be looked at and presented from different angles with different stories – history, heritage, famous people, nature, food and many more. Travel search is changing and people in general, but especially Millennials, are seeking inspiration and guidance when it comes to travel planning. This is also the principle behind Ascape – to promote travelling and tourism with immersive video content. Daniel and his team showed us what is possible if one works with passion on a project. We believe that this fact should be understood as an inspiration and we are curious how VR in tourism (promotion) will continue to develop. We would like to thank Daniel for the insights into Ascape! And without doing any covert advertising, we would recommend to download the app (available for Android as well as iOS) and go on a virtual trip 🙂 It’s simply amazing. Enjoy.